Now that spring has arrived it’s only a matter of weeks before summer makes her special entrance, full of gleaming rays of sunshine. But, don’t fret, if you’ve only now started to embrace a milder climate! There’s plenty of time to gather style inspiration for the summer months, especially for a relaxing holiday. 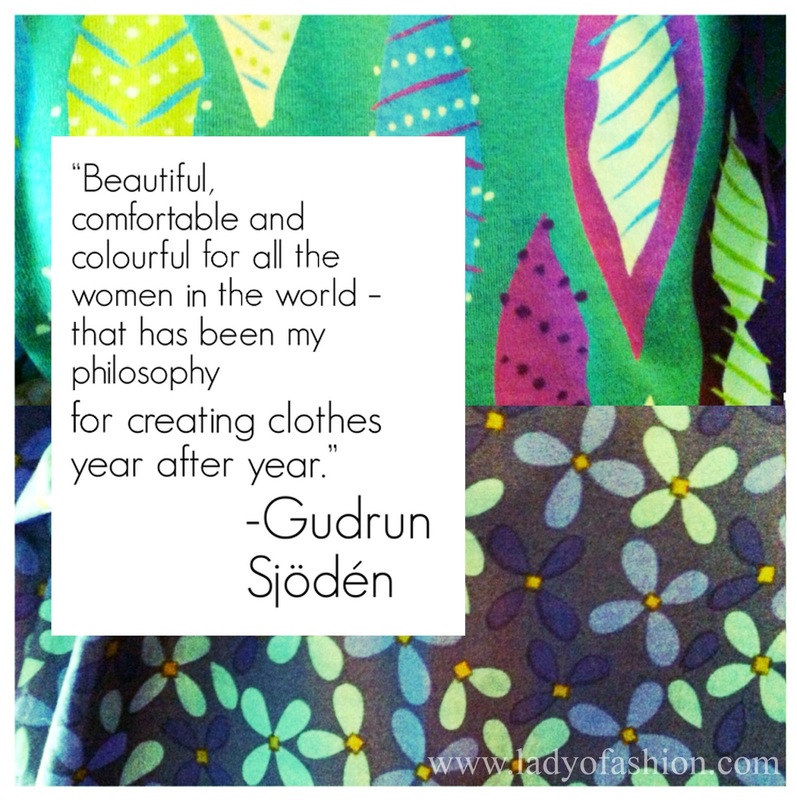 This time around, we’re excited to show you pieces provided from the Gudrun Sjödén summer 2013 collection. So, as you take a seasonal respite from the cold, whether physically or virtually, enjoy the global influence of pattern and colour this week. I will take you on a slight detour through the gates of summer. In brief, the summer collection is French worker-chic meets sultry and brazen colour, all dripping from a worldly and saturated palette. From the village of Aniane, the South of France to the Kalahari Desert of Africa, there’s much inspiration to absorb and appreciate in this collection. You can expect to see solid brights of organic cotton and modal as well as jerseys and printed hues of sage, coral, indigo, and cherry, in addition to earthy tones united throughout the collection. It’s a mere artist’s palette of delight that’s translated from various locations for the summer. You needn’t worry, your ticket will cover all of our destinations. First stop: we’re headed South, and then West. Clothing: Courtesy of Gudrun Sjödén. Shop these items --> “Nattfly” eco-cotton windproof Jacket, “Svalört” lace-up Shoes in nubuck and nappa, and “Masai” Skirt in eco-cotton & lyocell. Don’t forget to visit the new Greene Street store if you’re in the New York area. You may also shop the summer collection online here. Looking for spring inspiration? See my favourite pieces from Gudrun's spring 2013 collection here. Madison, you look lovely and so ready for Spring with these fantastic and so ethnic prints and color combination. 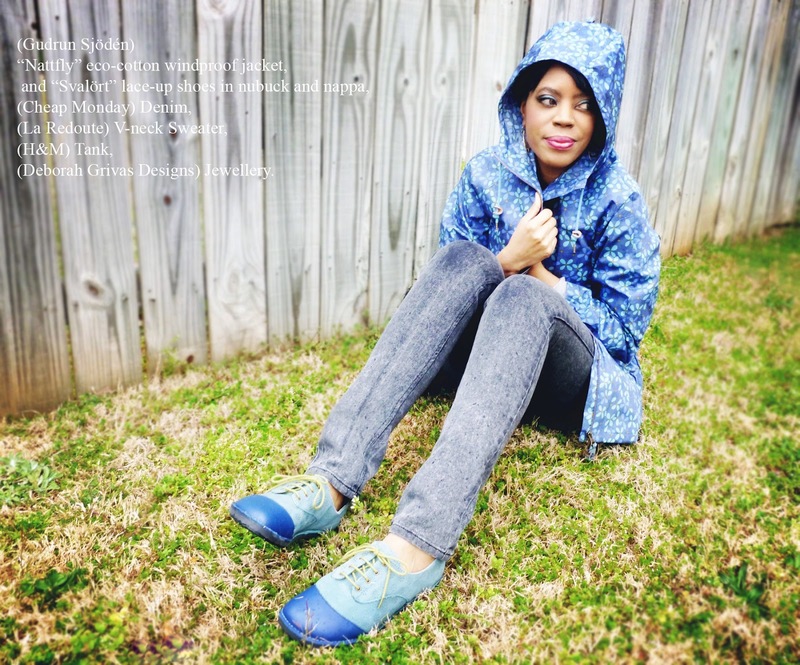 I adore those ballerina flats and the blue oxfords! so cute, even in the rain! Both of these looks are so cute!!! You've honestly put a smile on my face! the prints are absolutely adorable. I'm especially loving that rain jacket! Very cute! I love that skirt and top above! The print of the skirt is so lovely and I love the color of the top. Hello pretty prints! Such gorgeous spring looks, even the wind jacket. I think i need one of those over here! Love all the fun colors in the first outfit - that skirt is awesome! Honey you look amazing in both looks and I like the print skirt!!! You look so pretty!!! I love your skirt!! That skirt is SO gorgeous. I just love the print and the colors. You look so pretty in both outfits! I love both of these combinations. The first one is so girly and colourful and just stunning and the other is also very chic! You look so pretty!!! I adore your skirt!! I love all the colours you're wearing, so cheery! These colors are so pretty together!!! Beautiful look dear! what great looks! that first skirt fits you beautifully and looks so summery and great on you! Amazing and stylish outfits, both so charming! How fun and I love that skirt! How lovely you look in those bright colors! I especially love the skirt. Yes, thanks for your comment. Styling in general definitely affects how clothing is seen/worn. I love your colorful style darling! Love the skirt and the color! You look fabulous! What a pretty set of photos! I'm loving the bright patterns and colors. Thanks so much Vale. :) Happy weekend. Thank you. Glad that you came to visit. OK, that skirt is absolutely to die for. Like I need to have it in my closet. I love the way you style your outfits, it's so creative!! What a beautiful skirt! And I love the rain coat too! lovely look dear! adorable colours! in love with the first outfit ! So nice that you wear swedish design, but I also LOVE the handbag. Bright colours make me happy! I tend to wear bright in winter too just to brighten up the day! Wauw, love the colorful pencil skirt and that jacket is beautiful as well! The pieces from the collection looks great, I like the effortless way you styled the outfits you look great! :-) Ha, yes, I know very well, but hopefully sunshine will come your way soon! Thanks for your comment. Great! Happy to introduce you to this brand. There's loads of beautiful colours which I love! xo Thanks! I love the vibrant colors comfortable cuts! Love the first look, so colourful and pretty! love the color pairing in this outfit, makes me want to go back to the south so I can wear something like this!! 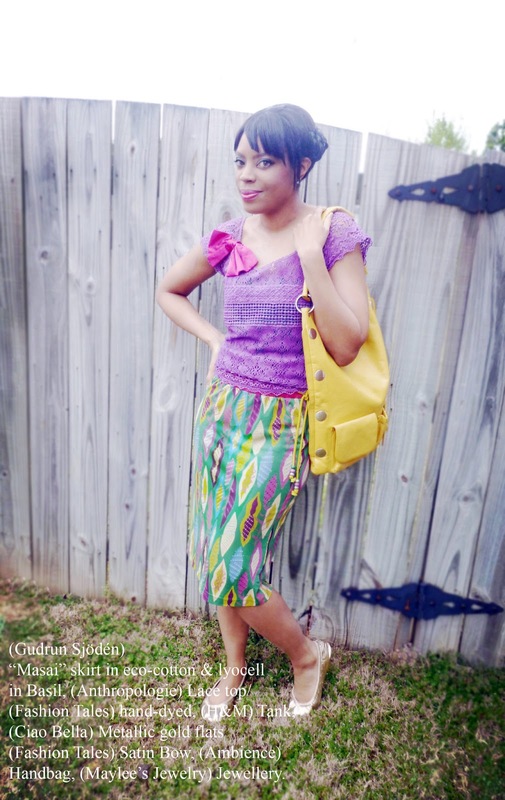 That bright print pencil skirt is adore! And I love your last photo in the rain slicker. So cute. you look so beautiful and colorful my love!! I love these looks!! That purple top is gorgeous and all the bright colors are so amazing! Love that purple and green look! So cute. This is one of my favourite outfits of yours. I adore the colours, so fresh and classy too. You look lovely and chic in these colors! Beautiful pieces - fresh and so colorful! Spring ready!! Hope you are having a wonderful day! Such a fun look! I love the 20's vibe that first top has with the floppy bow! pretty summerish! and fits you well. Thank you! It's one of my favourites, especially love the print! LOVE this look. The collection seems awesome! um, your blue oxfords? so cute. I really love the pattern of your skirt in that first outfit. dearie! thanks for the comment and the visit! love the shots! the jacket is so cool! <3 tones. A great philosophy! The unusual print and colour combination of your skirt are beautiful. Our warmer weather has disappeared and the rain is back so it's back to cardigans and jackets! Amazing skirt! You look so cheery! Very nice skirt on the first pictures. Lovely pattern and colors! that last pic of you is so cool! Wow, I love these clothes! Especially that bright colored skirt! Love your outfit! Especially that pretty skirt. 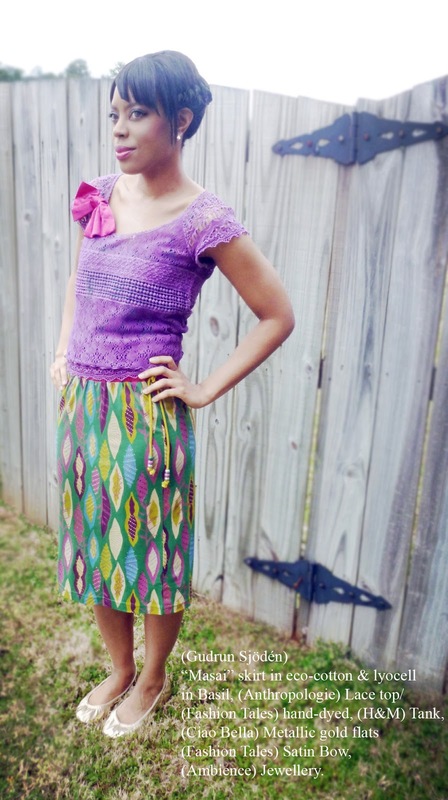 I love that pattern skirt with the purple top. That jacket is great too. As I said great look! oh what a beautiful look! i adore that shirt and the skirt! you look amazing! Great post Madison - lovely looks, particularly loving the skirt in the first photo! you look so great I love your shoes and your jacket, they're cool! 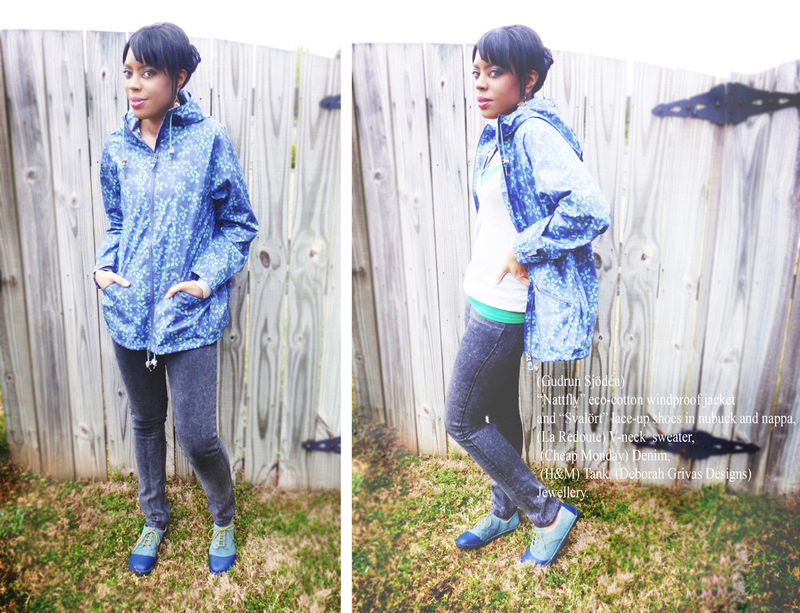 loove the raincoat! and your haircut is so cute on you :) following you now! so cheerful outfits great work girl!!! Lovely piece, the skirt looks very good..I like how you styled it.. I am such a colorfanatic,so this is defenitly my cup of tea! great job on the styling dear! Such goregous prints and colors, the skirt is so pretty! your braid in your hair is so cute! love the cute skirt and blue shoes! I like the skirt too! Gorgeous photos darling, love that tribal printed skirt! I like how you detail each piece..
and I don`t think i have ever had a raincoat ! pretty skirt! love the prints & colours! thats a lovely lovely skirt!!!!! What a lovely, evocative post - it fits perfectly with the gorgeous garments you're sharing! Loving the prints in these two looks! Hey dear, You have been picked as the winner for the give-away that i hosted on my blog. Kindly, give me your email id so that i can give you the details for claiming your prize. Hi! Thank you! :-) You can send me a mail here: madd@london.com. That purple top is so pretty! Great style! Love these colors on you! I love how you edit your photos to look like an editorial! I definitely want to copy your outfit cred style - so cool . Cant' believe you can still look so chic in the rain. to my blog to follow me – then I will follow you immediately back. I love all the colors you've chosen! The skirt in the first look, is amazing, the shape and print are amazing! Ooh the skirt is so cute! Love the blue shoes also! What an inspiring blog you have! Thank you for leaving a comment on my blog! I'll gladly follow you from Helsinki, Finland! I am loving all the colours in that first outfit! so pretty, and the print on that skirt! i love your second look.. its so chic and effortless..